Menu > More functions > POI Alert This feature enables you to be alerted whenever a point of your interest comes near you. Just put your phone in your pocket and enjoy the landscape without all-time staring in the map. Notify until stopped - notification repeats in defined intervals until abolished manually (press STOP on screen) or out of predefined distance from the POI. Tap Play to check your sound settings. Pattern - sets notification vibrating pattern, using three symbols: '.' for 200 miliseconds vibration, '-' for 500 miliseconds vibration and ' ' (space) for 500 miliseconds of silence. 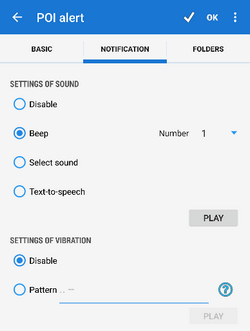 Tap Play to check your vibration settings. When the POI alert function is on an icon in the system topbar indicates its activity and the information on the set distance. if you select Notify once method, you will be notified only once of the selected point. The feature remains active. 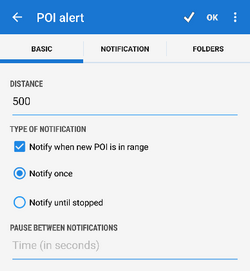 to stop or edit POI alert function, go to Menu > More functions > POI alert again and select Cancel or Edit. POI alert does not notify of LoMaps POI.